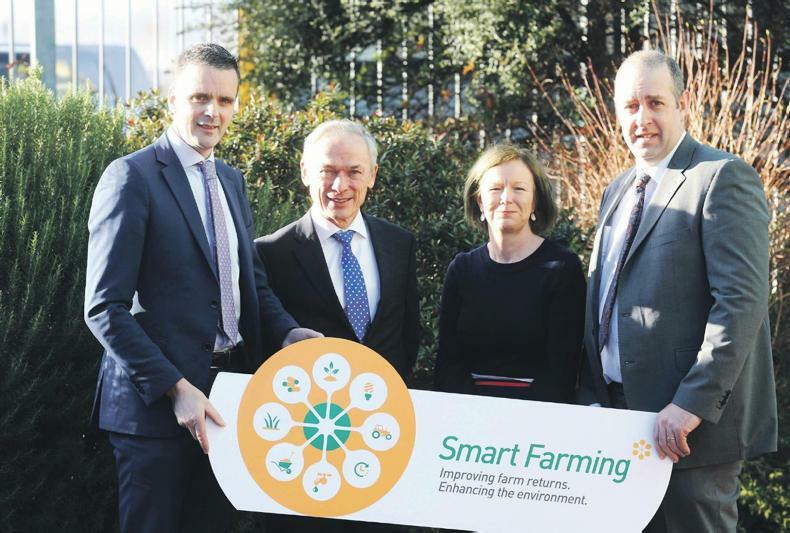 Launching the 2019 Smart Farming Programme are Joe Healy, IFA president; Richard Bruton, Minister for Communications, Climate Action and Environment; Laura Burke, EPA director general and Thomas Cooney, Smart Farming Programme leader. Smart Farming, the voluntary resource efficiency programme focused on identifying ways to improve farm returns and enhance the rural environment kicks off its 2019 activities this month. The Smart Farming cost-saving team is already out meeting farmers, with two clear objectives: to find ways to reduce costs on participating farms by at least €5,000 and how to reduce climate impact by 5-7%. Richard Bruton, Minister for Communciations, Climate Action and Environment speaking at the launch of the 2019 Programme said: “The Smart Farming programme is a great example of how agriculture can take the lead on sustainability, showing how the careful management of resources can reap both financial and environmental rewards for farmers. Smart Farming’s spring seminar will take place on Tuesday 30 April in Midlands Park Hotel, Portlaoise. 2.00pm – Opening address, Joe Healy, IFA president. Reducing costs and making an environmental difference. – Damian McDonald, IFA director general. Accessing the €10m on-farm renewables fund. – Michael O’Donoghue, Department of Agriculture, Food and the Marine. – Mark Coyne and Paul Fox, Teagasc. – Dr Karina Pierce, University College Dublin. 3.30pm – Panel and audience discussion. – Fiona McCoole, Environmental Protection Agency. Once a day milking - for sustainability. – Gillian O’Sullivan, Dungarvan, Co Waterford. 5.00pm – Panel and audience discussion. – Dr Paddy Wall, Professor of Public Health, University College Dublin. There is no charge. Please confirm your attendance by emailing smartfarmingifa.ie or call Eleanor Ryan at 01 426 0343. This is a Department-approved Knowledge Transfer dairy, beef, tillage, poultry and sheep event.